Helen Keller (1880-1968) is arguably the most famous person to ever come from Alabama. The story about how the young deaf and blind Helen was given words by her teacher, Anne Sullivan, is still well known. She went on from the water pump in Tuscumbia to become a Radcliffe graduate – the first deaf and blind person to ever earn a B.A. ; an acclaimed and much translated author and lecturer; a world traveler who knew French, Latin, Greek, and German, in addition to English, sign language, and Braille – and she could read lips with her fingers! ; and an advocate for the rights of people with disabilities. She was an American Socialist, a member of Industrial Workers of the World, and a pacifist who visited Hiroshima before the bomb and again afterward to lament the harm mankind is capable of perpetrating. We know that she fell in love with and planned to marry a man who served briefly as secretary for her and Sullivan and that the planned elopement never occurred. This was in a time when people with disabilities were most often discouraged from having romantic relationships. It seems she knew all of the most prominent people of her time: Alexander Graham Bell, Enrico Caruso, Charlie Chaplin, sculptor Jo Davidson, the Roosevelts, and Mark Twain were among her friends and she knew every American president from Grover Cleveland to Lyndon Johnson. Helen Keller had handicaps but seems to have overcome all barriers which were placed before her. Alabama chose her to represent the state on its state quarter in 2003 (the only U.S. coin to feature Braille) and Alabama chose a statue of seven-year-old Helen at the water pump to represent the state in the U.S. Capitol Visitors Center as one of two Alabamians in the National Statuary Hall Collection (Gen. “Fightin’ Joe” Wheeler is the other). Of course there is irony in the circumstance that what is considered one of the most conservative states in the nation is so prominently represented by such a progressive liberal. I love that irony. Helen Keller was a subversive in many ways. At her reading at Carnegie Visual Arts Center in Decatur, Alabama, on September 15, poet Jeanie Thompson commented that nowadays a traditional poetry reading almost seems to be a “subversive act” since such events are so rarely done anymore. Jeanie Thompson’s new book, The Myth of Water (www.uapress.ua.edu), is a lovely collection of poems “from the life of Helen Keller.” Each poem is an imagistic contemplative meditation in a first person voice. The persona is usually Helen but there are also poems in the voices of those who encountered her in her life. It thrilled me to know that Jeanie Thompson has a new collection on the shelves. I have known her poetry since we were both at the University of Alabama and her books like White for Harvest: New and Collected Poems and Litany for a Vanishing Landscape have a permanent home on my bookshelves. 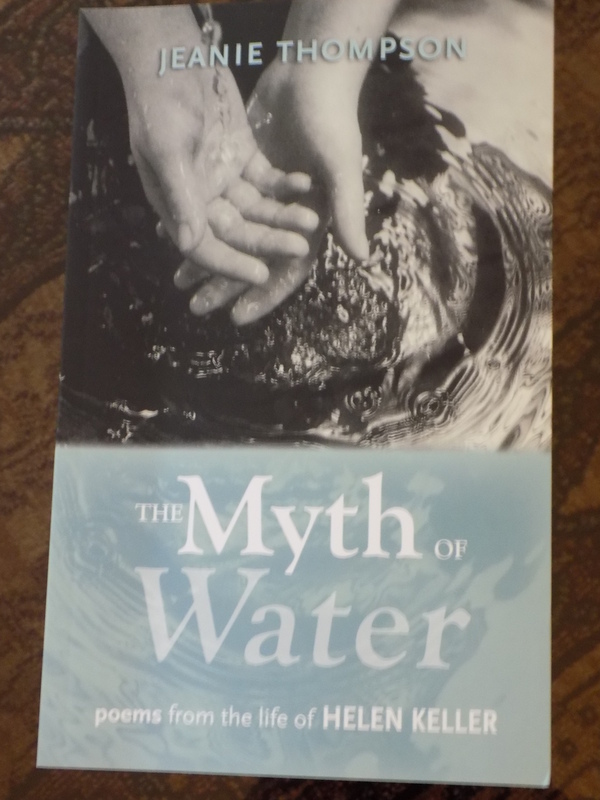 In The Myth of Water Thompson weaves a life from childhood to death and beyond in a series of brief and often breath-taking poems which attempt to break through the silence and explore what Helen Keller must have been thinking, feeling, seeing in her heart and in her mind’s eye. These are 34 poems of loss and longing, heightened consciousness and humanity, the challenges and triumphs of an unvanquished spirit hungry for life. Thompson’s is an ambitious and daunting project, flawlessly rendered. By entering a sensory-deprived existence, which found ways to not only compensate but to prevail, Thompson’s poems heighten the reader’s own senses and awareness. I thought I knew what I needed to know about Helen Keller. Now, after reading these poems, I long to learn more. The Helen Keller quote – in English and in Braille – on the Statuary Hall statue is “The best and most beautiful things in the world can’t be seen or even touched, they must be felt with the heart.” Thompson has made an imaginative journey into Helen’s heart. After the reading, I took the Upper River Road south of the Tennessee on the drive back to Huntsville from Decatur. A full moon shone down on cotton bolls that had just burst open, glowing white and pure in the dark fields, the first cotton I have seen this year. A light rain began to fall as I parked and headed to my back door. I turned to look up at the full moon, still showing through thin clouds. The cool water fell softly on my face as if for the first time. This entry was posted in Helen Keller, The Myth of Water by Jeanie Thompson and tagged Alabama, Anne Sullivan, Carnegie Visual Arts Center, Helen Keller, Helen Keller statue in Statuary Hall, Poet Jeanie Thompson, The Myth of Water on September 18, 2016 by gedwardjourney.